As part of the ongoing centennial commemorations for the First World War, this week marks the centenary of the Battle of Passchendaele. 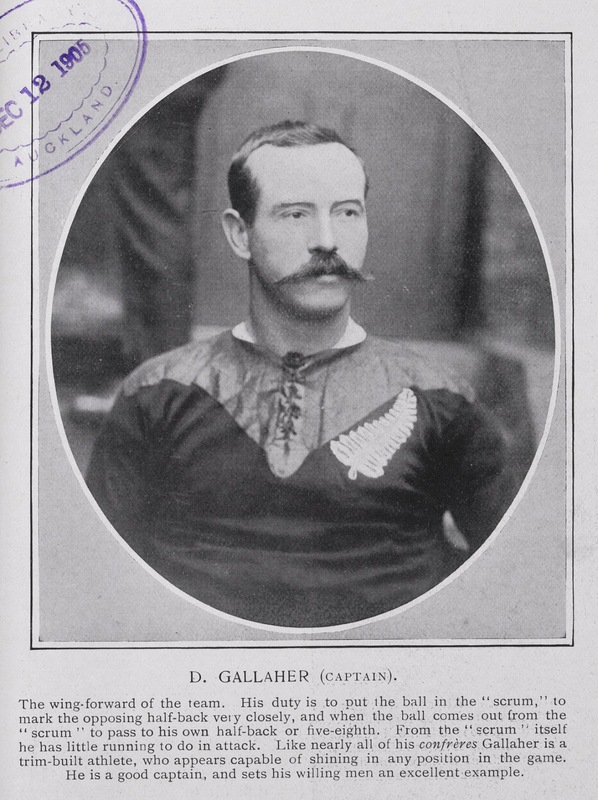 It was during this battle that one of the most famous New Zealanders of the day, the ex-All Black captain, Dave Gallaher was killed. Ref: Portrait of DaveGallaher. From: The king and his navy & army. A weekly illustrated journal for society, the salon and the services. 1905. Auckland Libraries. The centenary of Passchendaele and Gallaher’s death seem an appropriate time to reflect on how his 1905 All Black team were viewed in Britain. A colleague recently alerted me to the existence of the publication, Navy & army illustrated : A magazine illustrative of everyday life in the defensive services of the British Empire. Tracking Gallaher’s 1905 Originals tour through this weekly British Armed Forces publication we can see the mystique that Gallaher and his team created as well as the legacy they left. One simple way to see the impression the team left is how they are referred to by the writers in Navy & army illustrated as the tour goes on. The New Zealand Rugby Football Team. From: The king and his navy & army. A weekly illustrated journal for society, the salon and the services. 1905. Auckland Libraries. This team photo is from 30 September 1905, near the beginning of the tour. 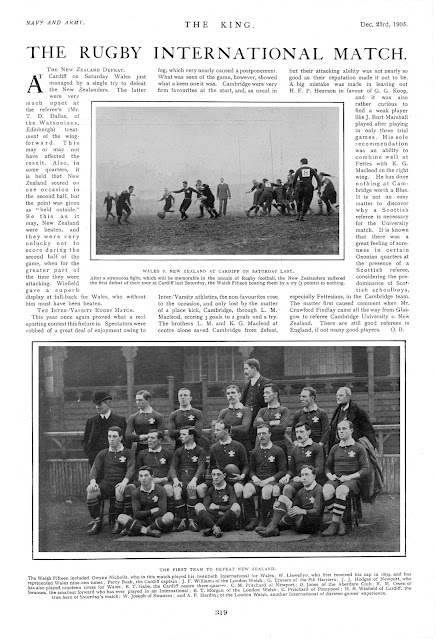 The caption reads: “The New Zealand Rugby Football Team. The remarkable success which the New Zealand team achieved in their first match was followed up during last week by victories over Cornwall and Bristol. In all the New Zealanders have scored 137 points in the three games, and have only had a dropped goal scored against them." It only took a few weeks for this to change to, “the ‘blacks’ as they are called” (October 14, p.35). 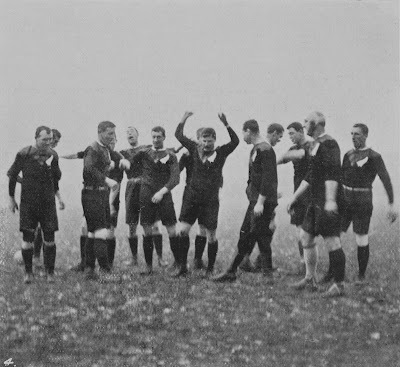 The All Blacks performing the haka. From: The king and his navy & army. A weekly illustrated journal for society, the salon and the services. 1905. Auckland Libraries. The test against Wales on the 16 of December was to become an even more famous game: The New Zealand Defeat. Match report. From: The king and his navy & army. A weekly illustrated journal for society, the salon and the services. 1905. Auckland Libraries. 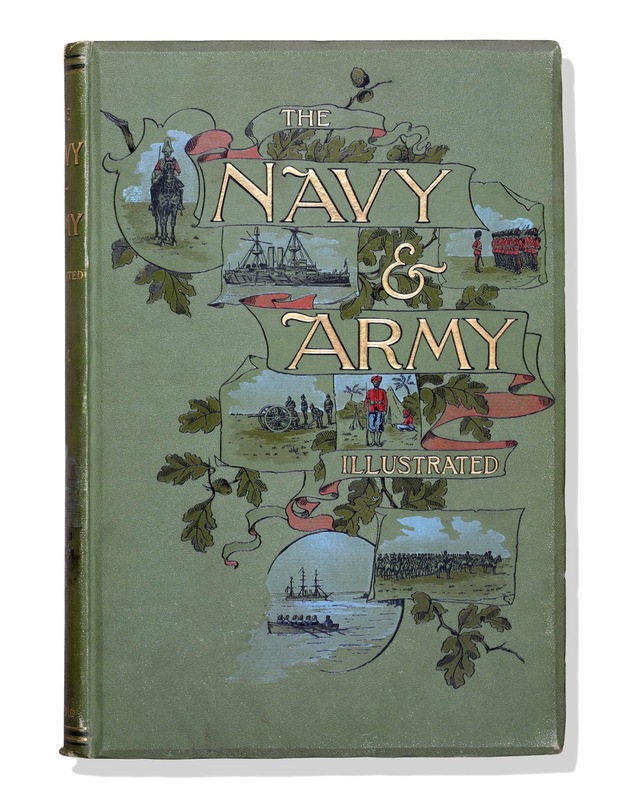 After King Edward VII’s coronation the title of Navy & army illustrated changed to The king and his navy & army. A weekly illustrated journal for society, the salon and the services. Considering the frequency and extent of colonial wars for the British Empire it is not so surprising that there was publication dedicated to the services. Initially it was solely focused on the Armed Forces and can be read as propaganda for the Empire however the scope changes as the new subtitle shows. The first few volumes have a wonderful publisher’s binding and are in great condition. Navy & army illustrated : A magazine illustrative of everyday life in the defensive services of the British Empire. Sir George Grey Special Collections. Auckland Libraries. As the title suggests it is a heavily illustrated publication with high quality images printed on glossy paper. Each volume comes bound and includes an index which is very helpful. It could be a very useful publication for family history researchers, for example it includes photographs of New Zealand troops involved in the South African war. The family history website The Genealogist digitised some copies and added them to their service earlier this year which can be accessed for free from within an Auckland Library. The hard copy editions are available through our reading room in the Central Library.